Okdo Xls to Ppt Converter is the easiest excel to PowerPoint converter. Own the most powerful conversion function. 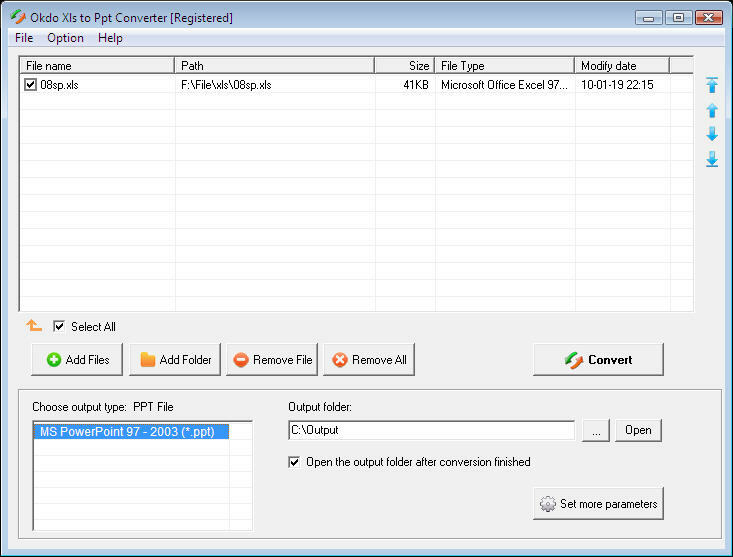 you can batch convert xls to ppt with ease. Okdo Xls to Ppt Converter can convert with high output quality and very fast speed. User-friendly interface is very easy to use with merely a few clicks. Simultaneously convert massive xls format files to ppt once with ease. Support merge multiple sheets of one xls to one ppt. * Support merge multiple sheets of one xls to one ppt. * Custom to adjust the lantern slide size and direction. * You can load the whole folder to convert. * Save list: You can save the converted files to a list. Qweas is providing links to Okdo Xls to Ppt Converter 3.4 as a courtesy, and makes no representations regarding Okdo Xls to Ppt Converter or any other applications or any information related thereto. Any questions, complaints or claims regarding this application Okdo Xls to Ppt Converter 3.4 must be directed to the appropriate software vendor. You may click the publisher link of Okdo Xls to Ppt Converter on the top of this page to get more details about the vendor.